A year and a half after their indictment, will the members of PLA Unit 61398 ever see the inside of a federal courtroom? On May 19, 2014, Attorney General Eric Holder walked up to a podium at the Justice Department and accused a group of five hackers with names like UglyGorilla and KandyGoo of carrying out a high-tech campaign of electronic burglary against prominent American businesses like U.S. Steel and Westinghouse Electric. Despite their teenage monikers, the 48-page indictment said the perpetrators were soldiers from Unit 61398 of the People’s Liberation Army, a premier crew of cyberwarriors within the Chinese military. Since the indictment was announced, cybersecurity experts say China has altered some of the methods used by its hackers but that its campaign against U.S. firms remains active. “We’ve seen tactical change but strategic continuity,” said Jen Weedon, a manager for threat intelligence at FireEye, a leading cybersecurity firm. She added that Chinese hackers have changed some of the malware and infrastructure they used for attacks but were continuing to target U.S. firms. Government agencies like the Pentagon, meanwhile, say that Chinese hackers attempt to infiltrate their systems hundreds of thousands of times per day. 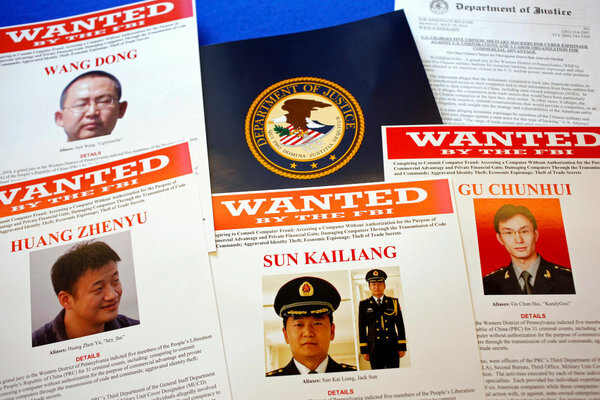 China has denied allegations that it breached OPM’s servers, and has in the past rebuffed American complaints about its hacking activity by denying responsibility for specific incidents and pointing out that the United States also carries out electronic espionage. With no evidence that China is scaling back its activities in cyberspace, Washington stands on the verge of escalating pressure on Beijing to rein in its hacker army. In April, Obama signed an executive order granting him the authority to apply the formidable sanctions power of the United States to block individuals and entities responsible for carrying out cyberattacks against U.S. targets. American officials say no final decisions have been reached about the timing or composition of those potential sanctions. It’s far from clear if any of those measures will be enough to deter China, which is thought to have some of the most sophisticated hackers in the world — and which uses cyber-espionage to aid both its companies and its military. By sanctioning companies who receive stolen intellectual property, U.S. officials hope to add some teeth to that deterrence strategy. Robert Knake, a former director for cybersecurity policy at the National Security Council, said that sanctions targeting companies that have received American trade secrets may dissuade other Chinese firms from accepting such material. Because a large part of the global financial system runs through American banks, U.S. sanctions can have the effect of freezing out a firm from large parts of that system. “It’s essentially a company showing up and saying, ‘I don’t want this. I’d just rather run it on the straight and narrow,’” Knake said. If the indictment is any indication, U.S. sanctions may also target those who pilfer trade secrets. Knake said American sanctions could go after Chinese cybersecurity firms who do legitimate business while also dabbling in illicit activities to bolster their bottom line. By that same measure, it’s unclear if the United States could convince China to abandon economic espionage. With the Chinese economy posting lower growth figures and its leaders encouraging the country’s companies to develop more value-added exports, there’s pressure on business leaders there to innovate. Economic espionage is a convenient way to lower research and development costs. U.S. officials frequently describe the attempt to deter Chinese hacking — whether by sanction or indictment — as an attempt to “raise costs” for such behavior, but what is the threshold at which Beijing no longer considers hacking worthwhile?